« Does Yesterday’s 90-90 Lowry Up Day Change Anything? Volatility Index Divergence: Bullish Or Bearish? As more and more days go by with the market dancing on the thin line marked by the November 2008 lows and the VIX staying much lower, the divergence gets more and more attention. In fact, the VIX has not even been able to muster a challenge to its January highs of 57. Like most indicators, this divergence can be interpreted several ways, depending on your existing bias. If you happen to already have bullish tendencies, then you’ll probably interpret this circumstance to mean that the market is healthy since this is the classic ‘bullish divergence’ in technical analysis. Also, back in October 2008 when the VIX first hit 80 (and beyond) that didn’t mark a definitive bottom - so why should be expect a high VIX reading at those levels again to have similar significance? If you happen to be a bear, then you’re probably thinking that the VIX must, at some point, be forced to revisit the highs it reached back in November 2008 before the market can truly find a lasting low. After all, if the VIX is so low (relatively speaking) that must mean that the options market is complacent. And no real bear market can be killed by complacency. Personally, I’m not sure what to think. We are in a very strange market and it is fascinating to watch. But beyond that, if pressed I would slightly shuffle over to the bullish camp. The CBOE volatility index is calculated based on the options market - which has been absolutely bonkers. By that I mean that it hasn’t followed the usual historical patterns. Over the past few months, I’ve struggled to make sense of it but I keep returning to just shrugging my shoulders and thinking that the options market has gone crazy. What do you think is really going on? what does the VIX divergence mean? and the eccentricity of the options market? 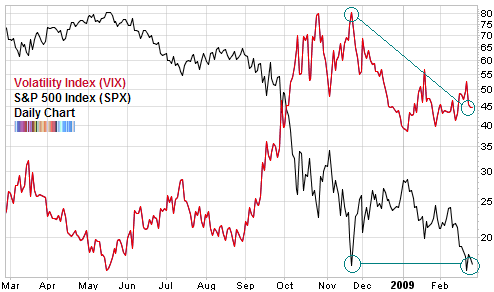 I´m not sure what to make of this divergence in the vix. But i think that put/call ratios are painting a bearish picture. Look at the 20day moving average of the cboe total put/call ratio. Since the panic in october 08 it is constantly moving lower and is now close to a two year low. Seems like traders are increasingly anticipating that the market is forming a bottoming pattern instead of a continuation pattern. I would be surprised if the market bottomed out here with such a relatively low put/call ratio. The stability of the VIX seems to be reflected in todays tape action, very bad news on both macro and corporate, yet the Market is down just 12 points, does it sense some conclusion to the bad news, so VIX confirms market behaviour? Maybe everybody is used to drop drop drop like there’s no tomorow?! Maybe bear market is the “norm” now?! And since everyone is so used to 3-5% drop everyday and 3-5% up, unless we have like a 10% 20% drop a day, we will never get that $vix to go up anymore?! Or the other way to interpret is that look at back when $VIX was high, look at the daily bar of SPX, is HUGE! Now even though we are at 740 which last low, we have a steady staircase down rather then a huge bar drop. So no huge voliitlity? blues, i think you are right, vix does’nt track trend, just swings in volatility so it’s hard to draw bullish conclusions as the market keeps dropping, no confirmation there, maybe we are seeing some capitulation volume today though? It is interesting to watch the historical volatility of the vix. Right now the volatility of the vix is steadily declinig. I couldn´t find an important bottom in the past, without a spike in volatility of the vix. Adam Warner has a good discussion of the VIX.